Alexandria Ocasio-Cortez is standing her ground … and who could blame her? On Tuesday evening, Feb. 5, 2019, the progressive New York representative took to Twitter to address a particular controversial comment made about her appearance during — and reaction to — President Donald Trump's second State of the Union address. After praising the president's speech, in part, as "deeply adept … in terms of policy" on topics like immigration, abortion rights, and foreign wars, writer Peggy Noonan had tweeted, "And good natured with the white jackets, who I see some on twitter are calling the straight jackets. AOC had a rare bad night, looking not spirited, warm and original as usual but sullen, teenaged and at a loss." In response, Ocasio-Cortez wrote, "Why should I be 'spirited and warm' for this embarrassment of a #SOTU?" She added, "Tonight was an unsettling night for our country. The president failed to offer any plan, any vision at all, for our future. We're flying without a pilot. And I'm not here to comfort anyone about that fact." Of course, the freshman congresswoman, who also notably refused to give a standing ovation during the speech, wasn't the only one to take issue with the perceived misogynistic tone of Noonan's tweet. 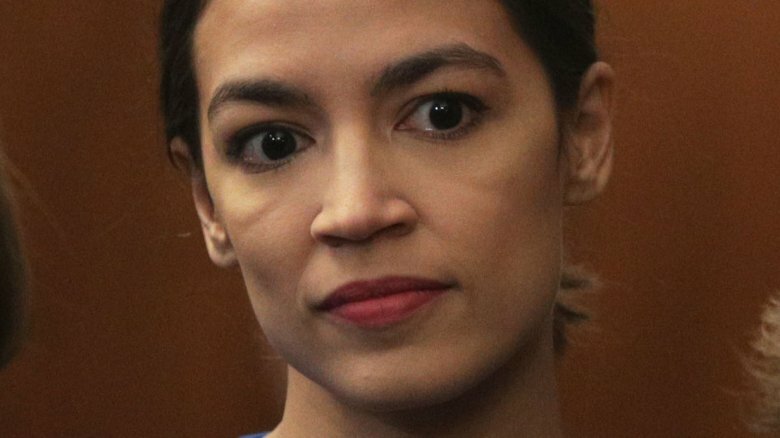 It wasn't long before a number of social media users came to AOC's defense. "STOP TELLING WOMEN TO SMILE," political analyst Zerlina Maxwell, for example, tweeted. Meanwhile, military veteran and writer Charlotte Clymer shared, "Peggy, I know it seems unfamiliar to folks who feel a deep need to engage in ceremony for the most vain of leaders, but @AOC reflects most of the country on this: we're not going to smile and clap like seals to make him or you comfortable. Her honesty tonight is what we want." Readers may already be aware that Ocasio-Cortez, 29, won her seat in the House by a landslide against Republican Anthony Pappas in November 2018 (via The New York Times). Having run a grassroots campaign on issues like healthcare reform, gun control, and raising minimum wage, the latest star of the Democratic party made history in early January 2019 as the youngest woman ever elected to Congress, as reported by CNBC. The Millennial politician has since continued to dominate headlines while playing her part to officially bring politics into the age of social media. 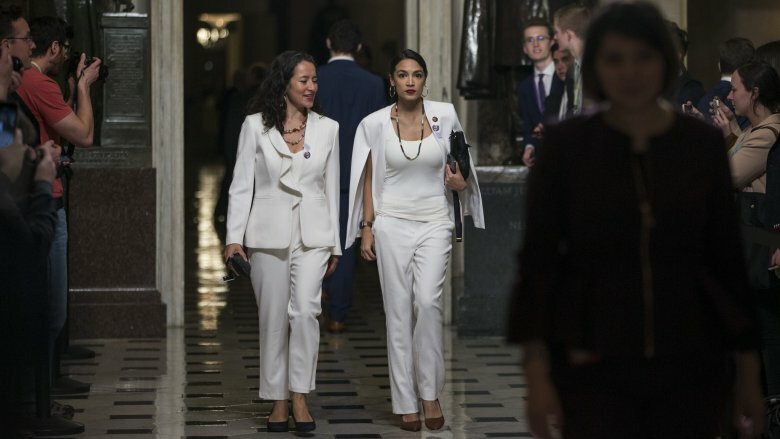 "Walking into #SOTU like," she wrote to her 2.1 million Instagram followers on Tuesday, captioning an already iconic snapshot of herself and her guest, activist Ana Maria Archila, entering the House chambers in matching white. Readers may recall how Archila famously confronted Sen. Jeff Flake in an elevator last September to protest the confirmation of Justice Brett Kavanaugh to the Supreme Court in the wake of multiple sexual assault allegations (via CNN). According to CBS News, the Center for Popular Democracy Action's co-executive director had bravely recounted her own experience with sexual assault in an effort to persuade the senator to not vote in favor of Kavanaugh. 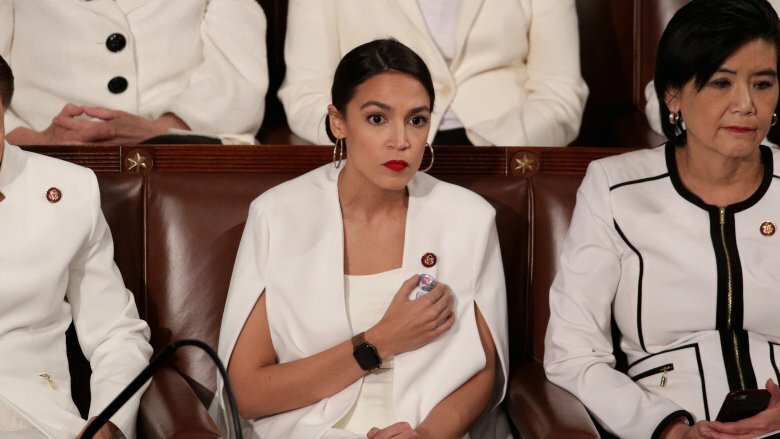 As for AOC and Archila's white outfits, which were previously mentioned above by Noonan herself, the New York Post reports that Democratic women in the House collectively wore white as a tribute to the suffragette movement. "Nearly 100 years after women earned the right to vote, more than 100 women are serving in Congress," Fla. Rep. Val Demings explained via Twitter. "Tonight the @HouseDemWomen are wearing suffragette white to remind the president that we—and the rights our ancestors fought for—aren't going anywhere." However, the powerful symbolism behind Ocasio-Cortez's white cape ensemble went even further than her some of her colleagues. As author Julissa Arce noted on social media, "@AOC is wearing a pin of Jakelin Caal, the Guatemalan child who died in custody of CBP." According to The Hill, 7-year-old Jakelin Caal Maquin tragically died while being detained in mid-December 2018 after crossing the Mexico-United States border. Fellow Reps. Rashida Tlaib and Ilhan Omar, respectively of Michigan and Minnesota, wore the same pin to the SOTU. Prior to Trump's annual speech, Ocasio-Cortez and Archila released a pointed joint message on the CPD Action Instagram page, which read in part, "Tonight is about hope and optimism. It's about all of us working together to build the country we deserve, we dream, and the country our communities need." They went on to note that "this is possible" in part due to "a new wave of leaders who are working tirelessly to counteract the hate that comes from Donald Trump." 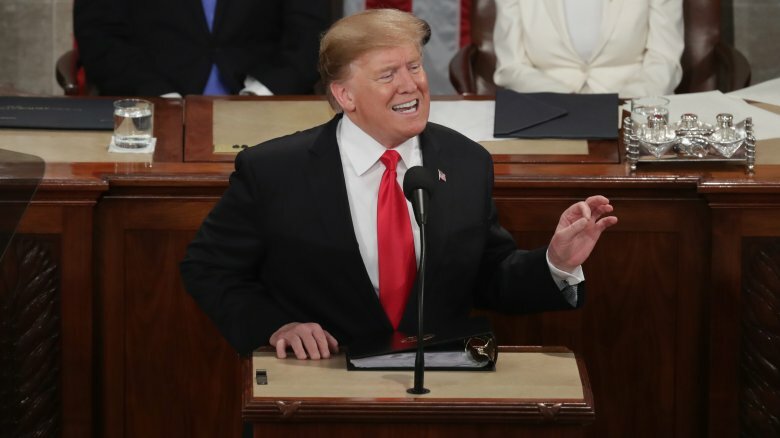 While the president's address received mixed reactions from leaders worldwide (via ABC News), CNN Editor-at-large Chris Cillizza, called it "a speech that was, in equal measure, surprisingly bipartisan and deeply divisive — reflective of the deep contradictions that sit at the heart of his presidency." Amid the increasingly divisive sociopolitical climate of the Trump presidency, then, Alexandria Ocasio-Cortez's reaction to the 2019 State of the Union address was far from the only one to have gone viral. Other notable mentions included New York Senator Kirsten Gillibrand's eye roll, California Senator Kamala Harris' head shake, and House Speaker Nancy Pelosi's apparent clapback.